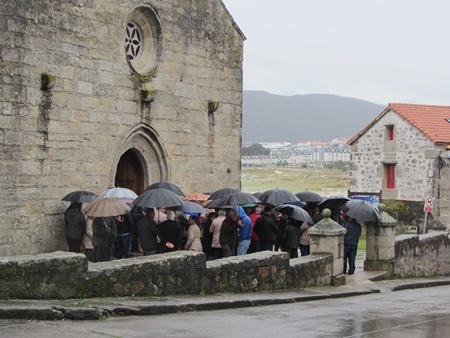 After a good swim in easonable weather we left La Coruna to make some westing for our (hopeful) passage to the Azores, although it appeared that the weather wasn't looking too helpful at this stage. The weather was a mixture of hot sun, cool clouds and showers.The scenery was again, glorious with high wooded hills behind and a coastline rather like a rugged version of Cornwall with may abrupt headlands and peninsulas, nearly all of which sported a lighthouse. The smell of Eucalyptus ever present. We arrived at the entrance to the Ria, giving a respectable distance to the jagged rocks guarding the entrance. By this time the weather was grey but the rising crests of the waves as they rose over the rocky reef were bright aqua blue. So much for the artisitic advice that the sea is blue because it mirrors the sky! 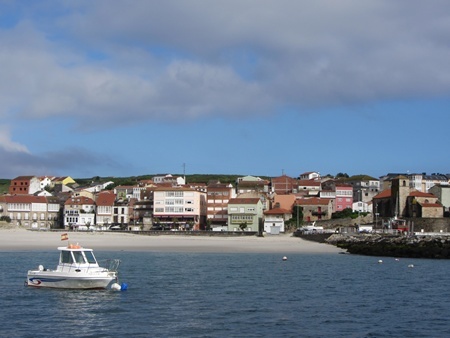 We anchored off yet another huge white sandy beach, tucked in behind the breakwaer of Laxe, a small fishing town. We awoke to pouring rain. This continued all day in various forms ranging from heavy downpours to drizzle. We managed to go ashore for supplies and enjoyed a short amble around the little town, trying out our Spanish in the butchers and bread van. We seemed to come away with the right provisions and had fun in the trying, with many helpful locals joining in the interpretation and giving us tips. Leaving Church. The Spanish love their umbrellas! Looking throught the grib files for the Atlantic showed very little wind for the next week, culminating in headwinds near the Azores. In order to arrive for the OCC rally, we would have to motor virtually the whole way. A week of noisy engine and rolly seas, and due to the predicted slowness of the passage, would probably not arrive in time. We took a decision to explore the N coast of Spain instead as neither of us fancied the aforementioned. The rain continued all night but by the morning the sun was shining. The clear waters and beach beckoned. I had a super swim along the shoreline, counting the many crabs sitting on the sand and waving their claws at me as I passed. On rteturning to the boat, D suggested that I bail out the dinghy which was being held afloat by its inflatable collar. It was very tempting so D handed me the shampoo and I had a refreshing bath before bailing out. Despite the decision to cruise N Spain, we both quite fancied a look at the Ria behind Cape Finisterre, so headed off further west as the wind looked promising for this direction.